On January 8, 1935, a woman gave birth to twin boys in a little shack built by her husband in Tupelo, Mississippi. It is not known whether or not the twins were identical. One twin was stillborn, the other grew up to be Elvis Presley. For the entirety of his life, Elvis missed his twin (named Jesse). He prayed to him, talked about him all the time. If you visit Graceland, there is a small gravestone for Jesse in the family burial plot outside the house. Elvis wondered if he had somehow sapped the strength of his twin brother in the womb, and if that was why he became the superstar that he did. He had guilt about it. "The Identical," an extremely strange, confused, and bad film, directed by first-timer Dustin Marcellino, and written by Howard Klausner, is an alternate-history riff on these ideas. The twins here are named Ryan and Drexel Hemsley (both played by Blake Rayne, an Elvis impersonator.) "The Identical" asks a series of questions: what if the twin had lived? What if the Jesse-twin had been given away by his parents because they were too poor to take care of him? What if the twins grew up not knowing about each other? What if the Jesse-twin also had a hankering to make music? What if he watched as his doppelgänger took the world by storm? The question I have is how the cringe-worthy music in the film, supposed to signify the birth of rock 'n' roll, could ever have taken any world by storm? The music in "The Identical" is what it would be like if Elvis skipped the rhythm 'n blues part of his influence and went straight to pop-lite power ballads. There is no sense in the film's music of Elvis' country and western roots or his love of gospel and there are none of the various intersecting influences that made Elvis' early recordings so genre-bending and revolutionary. All we have in "The Identical" are songs that make you feel like you've stepped into a community theatre production of "Footloose" mixed with "Les Miserables." And we are meant to believe that the entire culture changed because of the music heard in "The Identical." The film starts with a black-and-white flashback, showing a Depression-era cotton-picking husband and wife (Brian Geraghty and Amanda Crew), agonizing over how they will take care of their newborns. One night, the father stumbles into a tent-revival, and watches as the preacher (Ray Liotta) gives an impassioned sermon, talking about how it is better to give than to receive, and admitting to the sympathetic crowd that he and his wife (Ashley Judd) have been unable to have children. The father, watching from the back, gets an idea. If it is better to give than to receive, and if that nice godly couple wanted a child and couldn't have one, then maybe they could give one of the twins to them? And that is exactly what happens. It is agreed that the children will not be told of one another. Instead of following the rise of Drexel "The Dream" Hemsley to the top of the charts, we instead stay with Ryan, the twin who was handed over to the preacher. At an early age, the boy shows a gift for music, singing in the church choir, and his adoptive father thinks that God has called him to the ministry. Ryan loves God, does what his father says, attends seminary, but sneaks out of the house at night to attend music shows at fully-integrated (despite the fact that this takes place in Alabama in the 1940s) honky tonks and roadhouses. Something is happening in music! He wants in on it! One night he takes the stage and sings an horrific song called "Boogie Woogie Rock 'n' Roll" and the place goes wild! But how will he tell his father he doesn't want to be a preacher? People stop Ryan on the street, asking him if he's related to the new superstar. Everyone mentions the uncanny resemblance. But Ryan doesn't say to himself, "It's not just an uncanny resemblance. We look exactly alike, we're even played by the same guy. What's going on here?" There are only brief glimpses of Drexel Hemsley, riding on his private jet, dressed like Stevie Ray Vaughn, drinking high-end Scotch out of a glass tumbler, hands festooned with gigantic turquoise rings. The real theme of the story appears to be that God has a plan for all of us, and we are meant to answer God's call, whether that means being a preacher or being a rock star (or, in the case of Ryan, the very first Drexel Hemsley impersonator, billed as "The Identical.") Ryan doesn't want to just make a living imitating someone else though. He wants to perform his own stuff! He has written a song called "City Lights," a ballad that sounds like a Michael Bolton dirge, and everyone rants and raves over how it is a hit. Why won't the team who manages his impersonator career let him perform it at his shows? The music is so terrible and it is such a focal point of the film that it was difficult to get past it. Blake Rayne is fine in the acting portion of the role, if a little stiff. When he gets onstage, though, and audiences go crazy in response, it is impossible to see what they are seeing. The moves, the Elvis bumps and grinds, are indicated by Rayne rather than inhabited fully, and it repeatedly points out the gap between what we are seeing onscreen and the extraordinary level of Elvis' commitment to his performance style. In his famous 1977 Village Voice obituary for Elvis, Lester Bangs wrote about seeing Elvis in concert: "he had but to ever so slightly move one shoulder muscle, not even a shrug, and the girls in the gallery hit by its ray screamed, fainted, howled in heat. Literally, every time this man moved any part of his body the slightest centimeter, tens or tens of thousands of people went berserk." That's the reality. That's what happened. "The Identical" wants us to pretend that what we are seeing onscreen is akin to what Lester Bangs described. The quote, "Who you gonna believe? Me or your lyin' eyes?" comes to mind. Ray Liotta and Ashley Judd somehow turn in beautifully-layered funny and human performances, a minor miracle all things considered. Ray Liotta's preacher is not a fire-and-brimstone guy. He is thoughtful and loving and truly believes his adopted son has a calling in the ministry. He is pained at Ryan's deceptions, and pained that his son seems lost. Liotta manages to bring this envelope-thin character to full three-dimensional life. Judd (whose mother, Naomi Judd, interestingly enough, married Larry Strickland, a member of The Stamps quartet, Elvis' regular gospel backup group throughout the 1970s), is excellent as well. Marcellino is competent as a director, and the visuals are fine. There are nice period details throughout (although the vintage cars lining the streets gleam in mint condition, making the atmosphere kitschy rather than authentic). It is fascinating to contemplate that one of the biggest stars of the 20th century had a twin. "The Identical" tries to explore that, sort of, but there's too much bad music drowning everything else out. 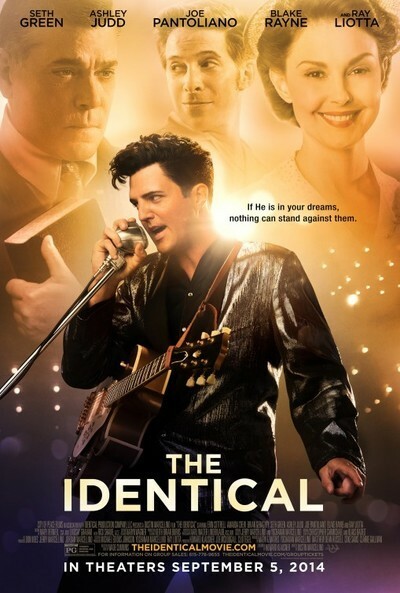 One positive thing about "The Identical" is that it will make you want to bust out Elvis Presley's early Sun and RCA recordings, songs like "That's All Right," "Lawdy Miss Clawdy," "My Baby Left Me," or "Good Rockin'" just to remind you that no, it didn't happen the way it did in "The Identical". Thank goodness.